PARIS (Reuters) - Britain will need months of preparation before Brexit talks can start, EU Commission President Jean-Claude Juncker said on Monday, chiding the government in London for not preparing better for the possibility of a 'Leave' vote. 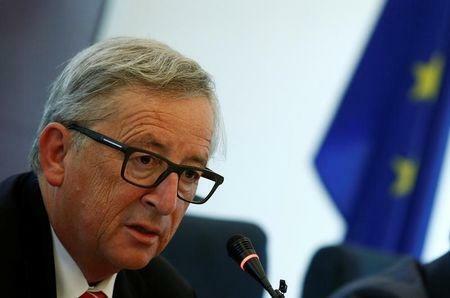 Juncker, who also confirmed Britain would lose unrestricted access to the internal European Union market if it did not accept free movement of workers, said his preference would have been for Brexit talks to start as soon as possible. "(But) this is not the case. The British government needs several months to fine-tune its position," Juncker told France 2 television. New British Prime Minister Theresa May told Juncker in mid-July that Britain hoped to hold positive talks with the EU following the result of the June 23 referendum, but needed time to prepare for the negotiations. Juncker said there was no deadline, since article 50 of the EU treaty, which specifies the exit procedures, could only be activated by Britain. "I would have preferred the UK presents us its letter of resignation, so to speak, as soon as possible, as I had thought that the British, especially those who wanted to leave the EU, would have prepared for this possibility," Juncker said. He said the EU would not grant tariff-free access to the internal market for UK goods and services if Britain did not accept free movement of workers from within the EU. "There will be no access to the internal market for those who do not accept the rules - without exception or nuance - that make up the very nature of the internal market system," Juncker said. French President Francois Hollande has warned that Britain would lose free EU market access and that the City of London would no longer be able to act as a clearing house in euros, if the UK stopped free movement of workers from Europe. Asked about Boris Johnson's comparison of the EU's aims to unify Europe to those of Adolf Hitler -- made before Johnson's appointment as foreign minister while he was campaigning for the 'Leave' camp -- Juncker said he was looking forward to meeting him. "He may notice then that the difference between Hitler and me is more than a matter of nuance," Juncker said.